Kelvin Long is an aerospace engineer and physicist, as well as the founder of Project Icarus - a design study for an interstellar starship - and is Chief Editor of the Journal of the British Interplanetary Society. In addition, as part of Project Icarus, he is involved in the 100 Year Starship Project. As such, he's the perfect author to write Deep Space Propulsion, a new book that details the technologies necessary to take us to the stars. Astronomy Now spoke to him about his vision for the future. 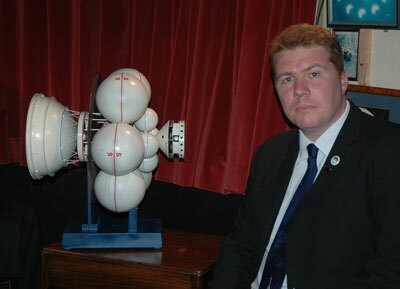 Kelvin Long with a model of the British Interplanetary Society's Project Daedalus. You highlight a variety of propulsion methods in the book, from solar sails to nuclear fusion, making the point that an interstellar mission might use several of these methods in unison. As things stand, which of these technologies is likely to mature first? This is very hard to answer right now as we have reasons for both optimism and concern. Optimism because of the many exciting experiments being conducted; the National Ignition Facility on fusion, Jim Benford's microwave beam experiments and solar sail demonstrations in low Earth orbit. We should also be encouraged because these developments are happening with a background of an ever-increasing number of exoplanet discoveries that may motivate further investment if an Earth-like world is found. However, there is cause for concern because of the state of the world economy. We've already seen the NASA science budget cut. All technologies are measured using technology readiness levels (TRLs) which go from one (conjecture) to nine (tested in the service environment). Most of the propulsion technologies we need for interstellar flight are currently at TRL2 where the physics principles have been established, with some creeping into TRL3, which is moving into the realm of engineering demonstrations. Then there is the wild card research at TRL1. 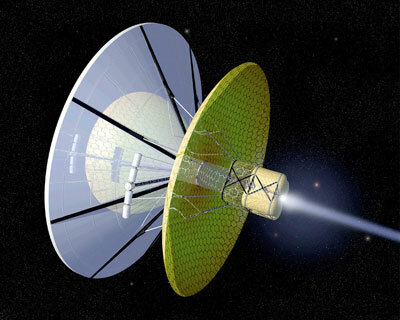 These are the breakthrough propulsion physics methods such as space drives and warp drives and we would be foolish to rule out the possibilities. However, if I was forced to hedge my bets, I'd bet on a form of fusion propulsion becoming viable within the coming decades. In order to reach the stars it is my belief that we must match the same power that fuels their engines - fusion reactions. A form of antimatter catalysed fusion may also have some role to play. It's also important to note that we do already have a technology today that can reach the stars - external nuclear pulse engines in the form of Project Orion - but we're not allowed to test that because of international test ban treaties. Ultimately, to become a truly space fairing civilisation, we need a means of propulsion that does not require any fuel. The interstellar ramjet was the great hope of interstellar travel until several fundamental problems were identified suggesting it may not work. However, we are a young species and, with time, I have faith in our ability to solve the problems, or any others we set our minds towards. Using an interstellar ramjet we could reach the centre of the Galaxy in less than three decades ship time, although several million years would have passed on Earth. Artwork depicting an antimatter-powered starship. Image: NASA. Your book is subtitled 'A Roadmap to Interstellar Flight'. Where do you view the colonisation of the Solar System within that roadmap, or is it not strictly necessary with regard to developing interstellar flight? One has to make the distinction between robotic and crewed missions. For a crewed interstellar mission, large mass requirements of order 65 tons per person suggest very large spacecraft masses. But you can't assemble such masses without having a space infrastructure in place that goes well beyond Earth orbit. To solve this we need cheap access to Earth orbit, as low as a few thousand dollars per kilogram. Ultimately, we also need to source materials from the Moon, Mars, asteroids and other moons. This requires we have explored the Solar System. Taking all this into account and the speed of space exploration so far, this suggests a crewed mission may not be possible until the year 2200 or later. Several studies have been done over the years that indicate this date is a plausible prediction by extrapolation of the current state of the art. However, the arrival of so called 'disruptive technology', particular artificial intelligence, will very much change the landscape of possibilities. Keep an eye on nanotechnology developments as an example to watch out for. It's a game changer. I'm also interested in the competing methodologies of SpaceX and Reaction Engines. Both companies have exciting ideas that could alter the possibilities. The space studies done by Gerard O'Neill and his colleagues during the 1960s and 1970s clearly demonstrate that humanity is far less constrained if we live on artificial worlds in space, with the vast volumes that this affords. In contrast a planet is confining and is arguably a 'limit to growth'. However, I believe both habitats are an important and fundamental part of the human future. Developing our capabilities to live in space (Skylab, Mir, ISS) and eventually on other worlds (the Moon, Mars) will build our capabilities, experience and confidence as a space-faring civilisation. This is the logical path by which human expansion from the Solar System will occur. What may change this, however, is a serious threat to Earth and, indeed, the Solar System that could risk our extinction. 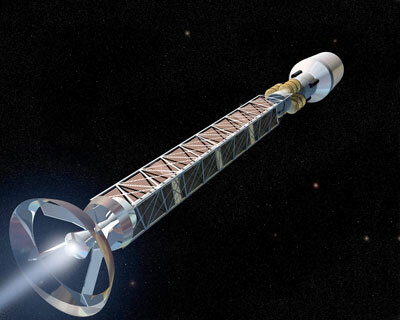 This would accelerate the path towards crewed missions to the stars, although for the wrong reasons. Regarding robotic missions, it is my view that these do not require a human interplanetary presence to the same scale as a crewed mission. I believe a robotic mission to the stars is feasible later this century. When one studies the history of robotic expansion from Earth and compares it to humans, the former trends towards medium growth, exponential expansion speed, whereas the latter is at best low growth, exponential expansion speed and at worst linear. Our robotic ambassadors must trail-blaze the way and then we can follow. The interesting question that arises is would ET do the same? Might the interaction between humans and another intelligent species be not through biological first contact as is usually assumed in science fiction, but through artificial intelligence? This is currently my view. An illustration depicting a fusion-powered starship, its Bussard ramjet design scooping up interstellar hydrogen as fuel. Image: NASA/MSFC. Do you have a favourite amongst the previous interstellar design projects? Project Icarus was started as a spin-off from the 1970s Project Daedalus, which was also initiated by members of the British Interplanetary Society and the fusion-based propulsion system that both Daedalus and Icarus use are my favourites. However there are others, such as the interstellar Orion as proposed by Freeman Dyson in the 1960s [which used a sequence of nuclear explosions to propel a ship]. I do not advocate the use of such technology within Earth's atmosphere but if you fire up the engine around Jupiter, a saturated radiation environment anyway, I don't see the problem. I do like Starwisp too, and Robert Forward was one of the main pioneers behind interstellar studies, constantly looking for propellant-less solutions. However, my concern for this sort of propulsion method is that although it looks completely viable for a small robotic probe, I am not sure if the mission architecture requirements are viable for a crewed mission. How big a laser and how big a lens do you need, for example? Otherwise, I love warp drive schemes. They may be pure conjecture right now but if nature figured out how to bend space then so can we, in time. In the early Universe space underwent an inflationary expansion period. In a black hole space collapses. This expansion and collapse of space is essentially how warp drive works and we can see this mathematically in Einstein's field equations of General Relativity. The key for us is how to engineer the effect and how much negative energy we require. Currently it looks prohibitively difficult on paper, with Jovian- to solar-sized mass equivalents of negative energy required to 'engineer' the warp drive effect. But given that academic warp drive work only started in 1994, it will be interesting to see where the subject is half a century from now. So don't discount the wild cards. I'm also a big fan of the Bussard interstellar ramjet although currently the physics and engineering problems seem to rule it out as being feasible. But again, don't discount the ingenuity of human beings. ESA's new Jupiter mission, JUICE, won't launch until 2022. Terrestrial Planet Finder has been delayed to the National Science Foundation's next decadal survey and at the earliest won't launch until the 2030s, while our next missions to Uranus or Neptune may not arrive at their destinations until the 2040s or later. Everything seems to be on a horrendous time-lag amplified by the current budget cuts to science and space exploration. How is this going to affect the development of deep space propulsion? For example your timeline at the end of the book suggests launching the 200AU (a probe to a distance 200 times greater than the distance of Earth from the Sun - Neptune's distance from the Sun is just ~30AU) mission in 2020; if this were announced tomorrow would we even be able to launch it in that time frame under the current constraints? My timeline was more a demonstration of what we could do if we choose to. Obviously many factors have to come together to make that happen. Sadly, the defining one is the political will to try but many politicians across the world lack a vision to think beyond the term of office. If we choose to, I believe that we could design and launch a 200 AU mission by around the year 2020. It would probably use advanced ion engines with a nuclear power source. It may take a while to get there, but it can be done. The achievements of NASA, particularly over the past decades in sending robotic missions across the Solar System, have been tremendous and I am humbled by the discoveries they make. However, NASA, like all national space agencies, is on a strict budget and subject to sudden changes in policies. This often leads to huge budget cuts. I think there is a sure way to make space exploration happen more quickly, which is to encourage commercialisation. Companies like SpaceX in the US and Reaction Engines Ltd in the UK are two examples of organisations that are trying to develop revolutionary changes in how we do space. We need to place space in the context of a business goal and allow for competition to bring the costs down. This will accelerate things in space very quickly. 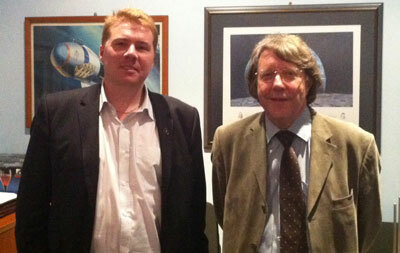 Kelvin Long (left) with Alan Bond of Reaction Engines Ltd. The way your book is set up would make for a great lecture course on the topic. Can you envision a day anytime soon where deep space propulsion is taught at undergraduate level or graduate level in engineering classes? Indeed, I am already working with a few educational establishments to develop such a course. I would like to see space science generally become a core part of the curriculum in schools, colleges and universities. It's an exciting topic that inspires the students to want to study maths, physics, chemistry or engineering. The biological life science problems relating to interstellar are also very interesting. If you take a world ship with a whole community of people that also has clear sociological, cultural and philosophical issues too. Project Apollo was both initiated and ended by politics and economics, showing that these are important. In a nutshell, every subject of interest here on Earth has applications to the exploration of space and its something that as a civilisation we should be focusing more on. A GCSE in Interstellar Studies in the United Kingdom would be a good place to start, but our country is probably too conservative to consider such a radical idea. Meanwhile, the people who do interstellar research have to make efforts to train up the next generation, to produce 'design capable' physicists and engineers. This is the main reason why I founded Project Icarus (www.icarusinterstellar.org), as well as to re-energise the entire subject of interstellar studies, given not much was happening around the world in the field. Many interested in space also watch Star Trek and are familiar with Star Fleet Academy. I have been advocating the construction of an Interstellar Research Institute for some time and I published a paper in the Journal of the British Interplanetary Society last year on the subject. I would like to see the equivalent of a university or institute set up dedicated purely to the subject of interstellar travel. Imagine hundreds of scientists and researchers coming together in one place to tackle problems relating to propulsion, human hibernation, mining fuel from Jupiter or designing new long distance laser communication systems. This is the sort of effort we need to make interstellar flight happen late this century. Anything short of this is just pretending that we want to go to the stars. Investment is required now, more than ever, despite the poor state of the economy. It will create jobs, it will create intellectual property and it will create new science and new technologies. Most importantly, It will solve all of the problems that currently prevent us from eventually making that trip. Who knows, the technologies and science developed may also have applications to solving problems here on Earth too. We need a daring philanthropist to come out of the woodwork and dedicate their money to the future of humanity. That's a legacy worth leaving behind for the people of Earth. Finally, a word about Sir Arthur C Clarke and the British Interplanetary Society. How much have they done in the past to develop concepts and keep interest in interstellar flight going, and how much can they still do in the future, given that now there is the 100 Year Starship on the scene? The British Interplanetary Society (BIS) has been there since the beginning. Founded in 1933 it is the world's oldest space organisation, yet in Britain it is not well recognised by the ordinary public when it should be. The BIS were designing credible lunar landers in the 1930s, decades before Project Apollo. Sir Arthur C Clarke was involved in some of that early work. Similarly, their interstellar Project Daedalus in the 1970s was the world's first credible starship design in my opinion, balancing being sufficiently bold with being sufficiently credible. In fact, the first ever academic paper to appear on interstellar flight was published by one of the society's prominent members, Les Shepherd, in 1952. I would say the BIS has been the 'torch holder' for the vision of interstellar flight and is still doing so today by facilitating the founding of Project Icarus. Many of the other authors who wrote papers on different subjects relating to interstellar also published them in the society's journal, the Journal of the British Interplanetary Society, for which I now have the honour of being Editor. Between the years 1974 to 1991 the BIS published the now famous red cover 'interstellar studies' issues of the journal and these contain the golden era of work on interstellar flight ever produced. What the BIS needs to do for the future is to keep the vision alive. This is difficult with the backdrop of a retreating space programme and a struggling world economy but, as long as someone is pointing the way, our species will always have a direction to go and no matter the problems here on Earth, we can get there eventually. Optimism and hope before the vastness of the void is the only way we can make that journey towards another star and find our second home.